A great rigid gift box doesn’t have to be complicated. We feature some especially technical designs in our Box of the Month series, but this time, we’re looking at how a clean, minimalist approach can yield spectacular results. 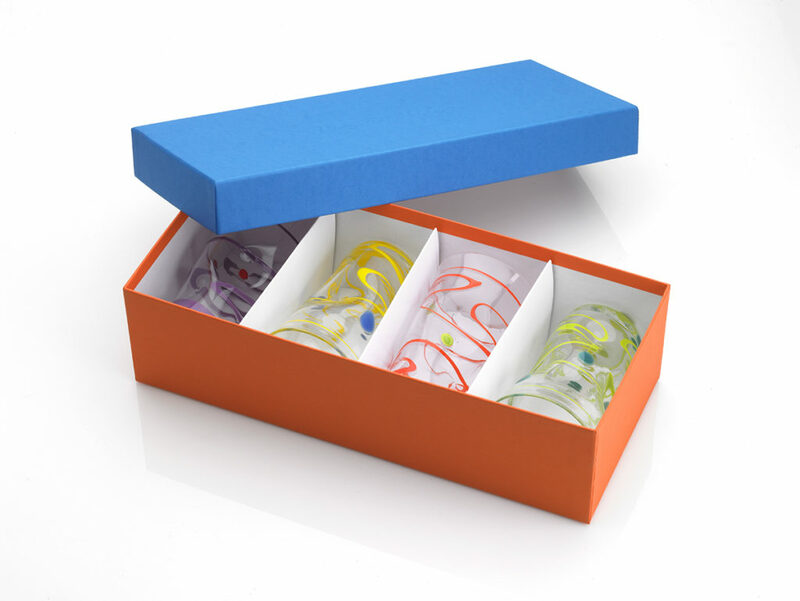 Colorful and distinct, this month’s base and lid box for Pean Doubulyu glassware is a perfect example of packaging enhancing a quality product. Providence is crafty. If you spend any amount of time in the city it won’t take long before you figure out the arts have a tight grip on the Rhode Island capital. Pean Doubulyu owners Elizabeth Pannell and James Watkins are contributing to that reputation in a major way. Creators of handmade glass vessels, the pair’s vibrant, playful work is sold in stores across the United States. Both RISD alumni, Pannell and Watkins flaunt their artistic prowess through an expansive line of custom glassware. Their work uses bold, contrasting colors juxtaposed against atypical, deliberately imperfect shapes. One of their lines of drinking glasses is called, appropriately, Wonkie Ware– a cue to the irregular shape of the vessels. Glass is the exact material that comes to mind when you hear the word fragile. It’s something that calls for maximum packaging; all sorts of insulation and protection. We didn’t quite do that for our collaboration with Pean Doubulyu. Featuring only a thin folding insert to separate individual pieces, this box was all about accentuating the work within. Design doesn’t get much more straightforward. This base and lid construction was composed of .060 chip 100% recycled board. The lid fits snug over the base, and by all appearances it’s a typical rectangular box. So what makes it our Box of the Month? The ingenuity of Liz Pannell in selecting a palate of colors to mix and match with each box. These boxes were each wrapped in a different shade of paper from Ecological Fibers. With four different base colors and four different lid colors, there are up to twenty four combinations possible; twenty four different possible rigid gift box designs! The two-tone appearance is incredibly pleasing. The simple, solid colors are an easy visual to digest and even without decoration (save for a blind deboss of the Pean Doubulyu logo on the lid) the packaging is absolutely magnetic. Two sizes of the box were created to accommodate two varieties of glassware; the standard tumbler and the shorter old fashioned glass. Each box was built to contain four glasses each. And it’s only when you open this packaging that you appreciate how the vibrant colors of the box so perfectly compliment the vivid glassware within. Pean Doubulyu’s products are popular wedding and housewarming gifts. As something that you purchase with the intention of giving away, you’re obligated to provide some sort of gift wrap. This packaging accomplishes that very function. 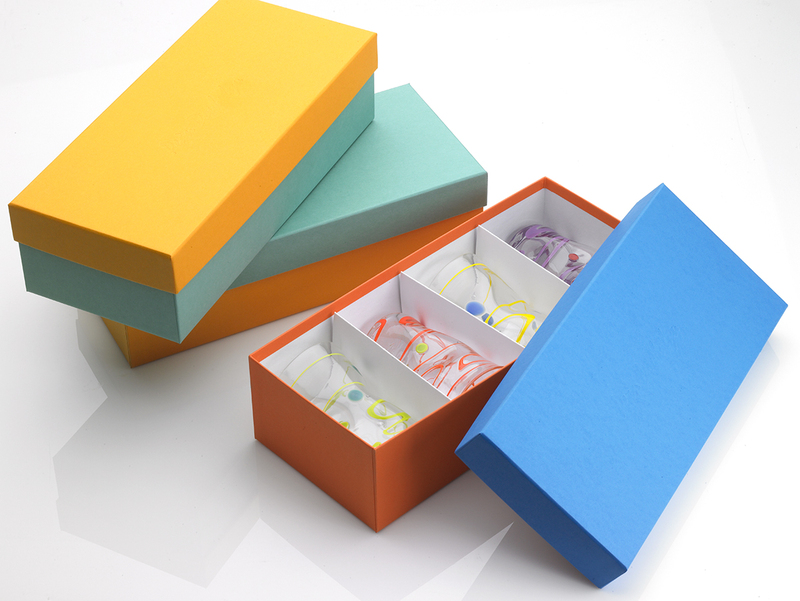 Rather than stuffing one of Pean Doubulyu’s glasses full of newspaper and anxiously arranging it in a bag, this colorful packaging serves as a worthy gift box. We’re told that Pean Doubulyu customers have tried to purchase the box by itself. 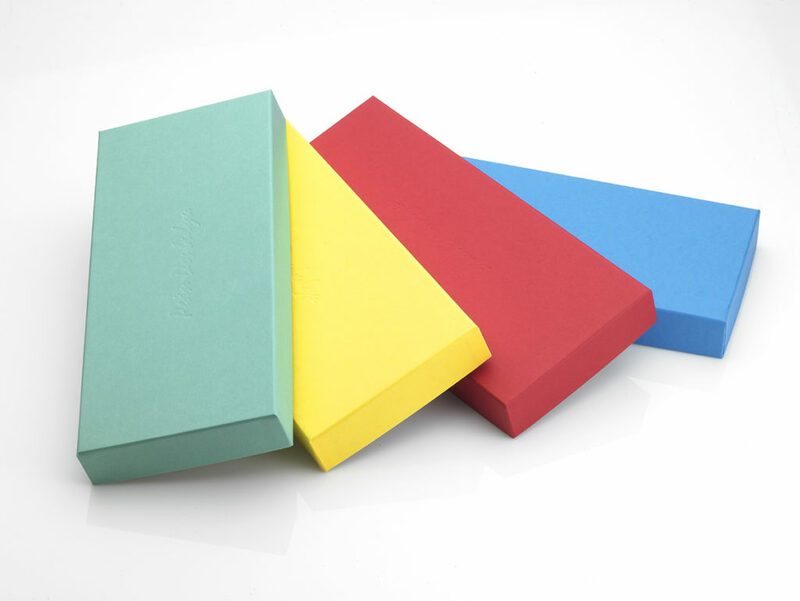 If you manage to get your hands on this polychromatic packaging, don’t sweat about what to do. The Pean Doubulyu box can easily take on a second life as a keepsake box or storage container, and in the unlikely event that anyone would want to part with it; the box is 100% recyclable.